The best way to nurture leads changes over time. A method that was highly effective two years ago might not work at all today. Algorithms change. People get overwhelmed with messaging and learn to ignore certain channels. So it’s important to stay up to date on what lead nurturing tactics are most effective right now. After all, even qualified leads need nurturing. 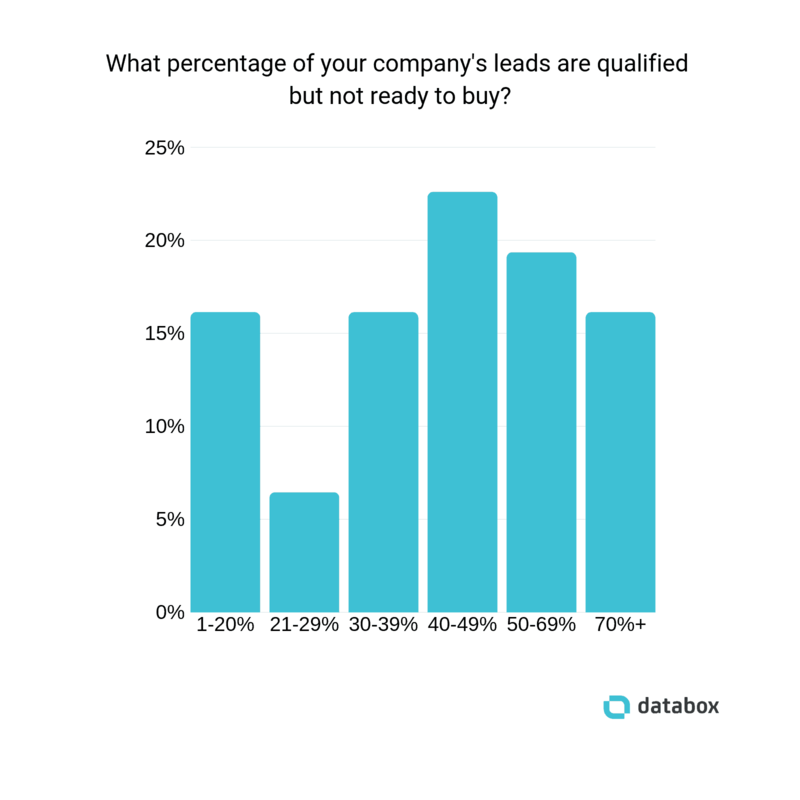 In fact, more than half of the respondents to our latest survey report that 40-70%+ of their qualified leads aren’t yet ready to buy. 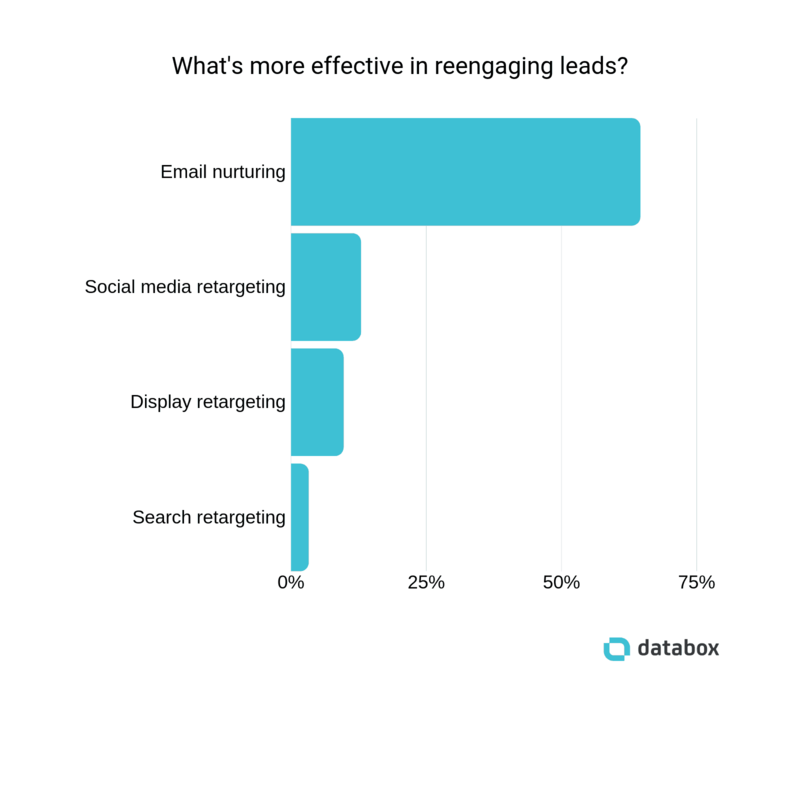 To find out what lead nurturing tactics are most effective in 2019, we asked 31 marketers to share the methods they’re currently using to nurture and reengage leads. 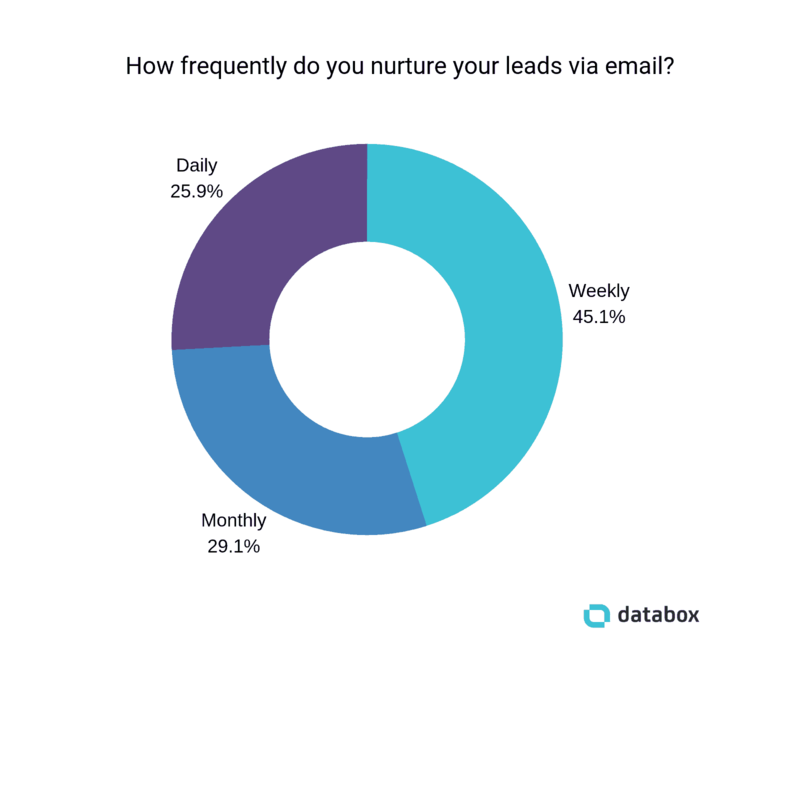 And while it would seem from those results that email nurturing is by far the best tactic, our respondents also recommended several methods we didn’t include in our poll. In total, they recommended six lead nurturing tactics. These are the methods they’re using right now to effectively nurture and reengage leads. 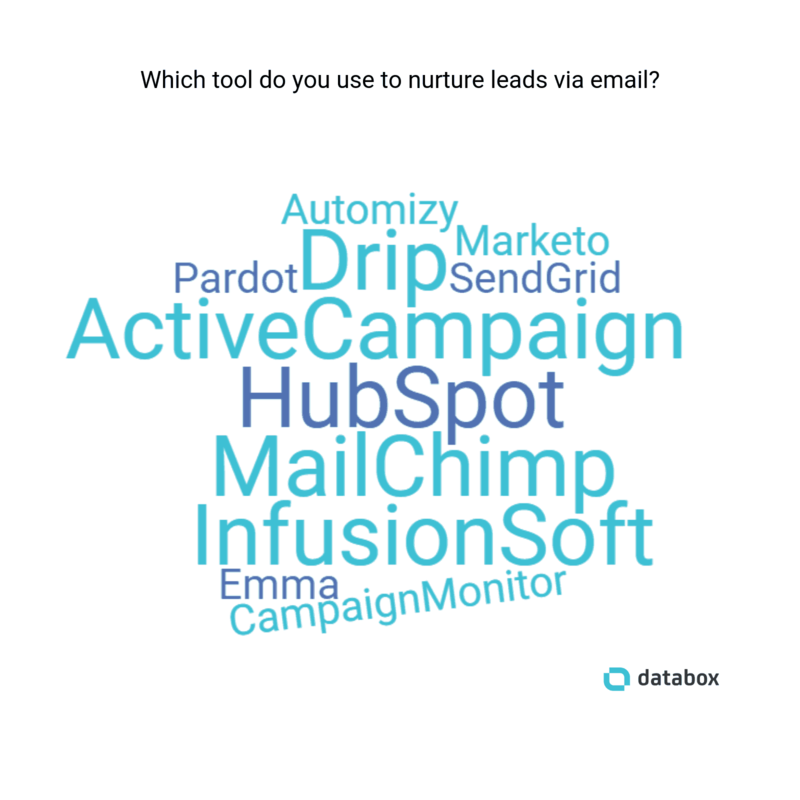 Our respondents use a variety of tools for sending and automating marketing emails, though HubSpot, Mailchimp, Infusionsoft, ActiveCampaign, and Drip received the most votes. In addition to weighing in on the right tools and frequency for email nurturing, our respondents also shared a variety of email nurturing best practices and examples for executing them. *Editor’s note: The best way to improve your email nurturing performance is by tracking how your current campaigns are performing. 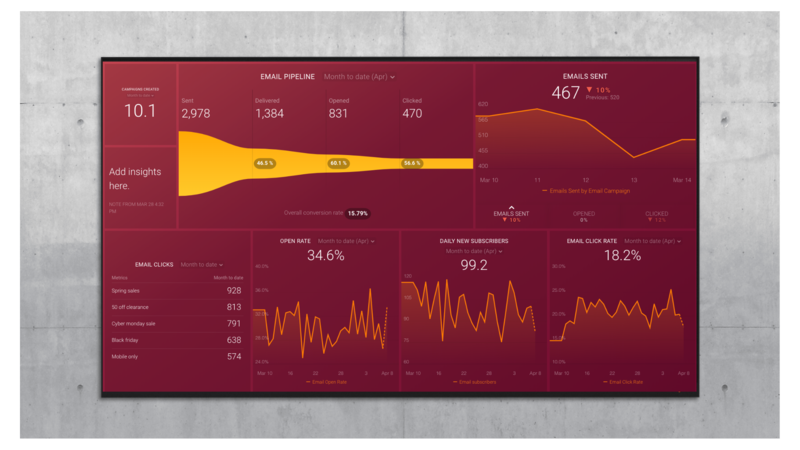 HubSpot users–download this free template and instantly visualize your email engagement, including where any spikes or dropoffs occur. Not a HubSpot user? No problem. You can download templates to track your email performance from ActiveCampaign, Campaign Monitor, Google Analytics, Klaviyo, MailChimp, Marketo, SendGrid, and Seventh Sense, too. “The key to email nurturing is to provide super-relevant and super-practical content that delivers real value to your leads on a regular basis,” says Nathan Reiche of Content Chemistry. “This keeps your business top-of-mind, keeps the lead warm, and gives you a natural opportunity to mention how your product/service can solve problems,” Reiche says. “The goal is to provide appropriate content that helps your leads—and not just trying to sell them something,” Deborne says. “One of the most efficient and effective B2B lead nurturing strategies for 2019 is a combination of video and email marketing,” says First Five Eight’s Richard Owens. “Then, you can integrate with your marketing automation software and CRM to track how much time leads are spending watching your videos, and you can use that data to set up triggers that notify your sales teams of the most nurtured leads,” Owens says. 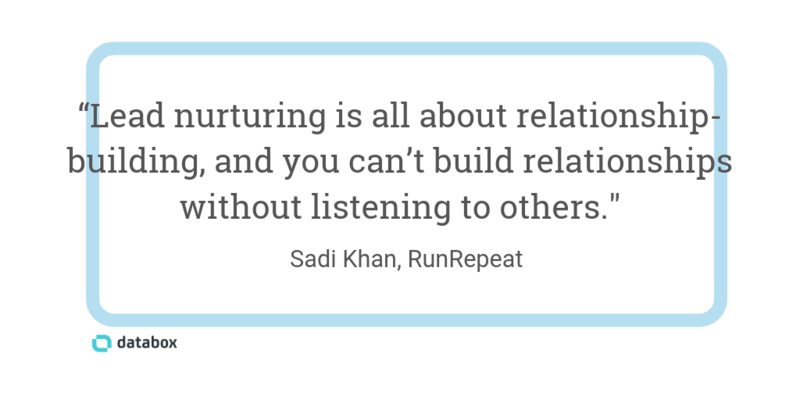 “Lead nurturing is all about relationship-building, and you can’t build relationships without listening to others,” says RunRepeat’s Sadi Khan. “This leads to a better engagement rate, more clicks, and more conversions,” Khan says. “As a marketer, you should track how leads interact with your emails to understand where they stand and adapt your messages to every different response,” says Teodora Pirciu of Impressa Solutions. “Check how many leads open your emails. Then, see how many also click on the links you included. Finally, create different messages for each segment of contacts based on how they interact with your content,” Pirciu says. “With a good drip marketing strategy and demographic segmentation, a company can use a custom Pardot integration to drive leads through the research phase and into the buying process automatically,” Coles says. “Additionally, we regularly create lists of contents that are at a certain lead score. We send those contacts personalized emails asking what their thoughts were on the offer they recently downloaded, offering recommendations for further reading, and eventually encouraging a demo call,” Polzin says. “After we made the change, we monitored our data and found that the new, shorter, and simpler automation works way better at converting people into sales-qualifies leads. The lesson: data-driven is the name of the game, and less is more,” Mester says. 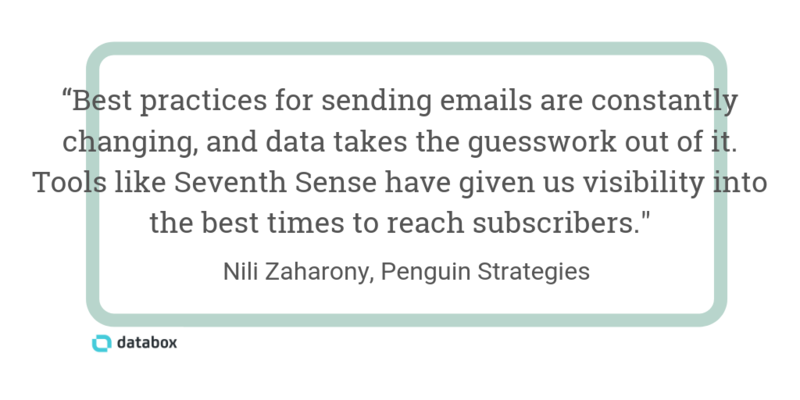 “Ultimately, data is what allows us to effectively nurture leads to close,” says Nili Zaharony of Penguin Strategies. “Best practices for sending emails are constantly changing, and data takes the guesswork out of it. Tools such as Seventh Sense have given us visibility into the best times to reach a given database. For one customer, we saw email open rates and engagement jump 25%,” Zaharony says. “Use tools such as Hubspot, Active Campaign, or Drift, and integrate them all with Databox to gather analytics and identify trends,” says Empathy First Media’s Daniel Lynch. “For example, you shouldn’t repeat the information that your leads were already exposed to on your website. Instead, switch it up and make sure you’re conveying the value of your product. If a lead wasn’t impressed with your demo, a retargeting ad would be the perfect place to attract them with a free trial,” Chyketa says. “One interesting thing with the older demographic, however, is that they require more consistent nurturing to turn over. We are a lot more willing to retarget our older audience than we are the younger one,” Rizzo says. “Also, display increases email opens because of more exposure to the brand. And by using display ads to nurture leads, they get less exposure to competitors’ ads because you’re using more of the available ad space,” Hoek says. “The best way to nurture leads is to pay attention to what the customer wants and avoid sending generic, templated responses,” says BitMoto’s Matthew Finke. In other words, your interactions with leads need to be personalized. “When we’re planning a campaign, we come up with a basic series of email templates, and then we personalize these as much as possible, adding in any unique details we know about the customer—like their name or interests—to help build that all-important relationship”. “Since implementing this approach, we’ve seen our open rates for emails increase by 46%, and we’ve seen a 30% increase in confirmed leads,” Martin says. “Then, instead of setting up and configuring individual campaigns for each segment and trying to route leads into the best one, you can create just one campaign. This allows you to save time, track results more easily, and deliver a seamless and personalized experience,” Zelenko says. 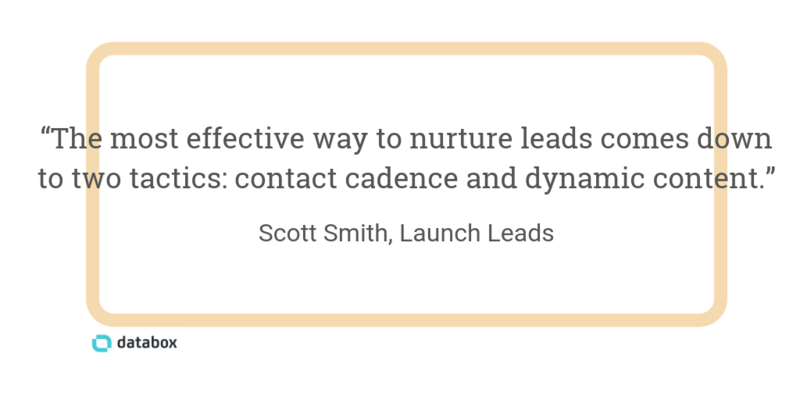 “The most effective way to nurture leads comes down to two tactics: contact cadence and dynamic content,” says Scott Smith of Launch Leads. “For example, reaching out with ‘I see that you recently launched XYZ product. I would love to take some time to show how our services can further leverage your initiatives to promote XYZ product,’ will generate significantly more interest than uninformed outreach,” Smith says. Of course, the most personalized interactions with leads are one-on-one conversations. “People often forget how important a true one-on-one touchpoint can actually be as part of the automation process,” says Jeff Arnett of Arnett Credentials. “Companies should try to include multiple personal touch points as part of the nurturing process. These personal interactions should be in between automatic processes, and they should be part of the funnel rather than outside of it,” Arnett says. “I recommend disconnecting from technology on a regular basis to focus on cultivating human, face-to-face relationships,” says Paige Arnof-Fenn of Mavens & Moguls. “I’ve found that building relationships is what drives my business, and technology supports those relationships once they’re solidified. Technology helps advance the conversation, but it will never replace those human interactions that build trust over time,” Arnof-Fenn says. “For the really important leads, set up calendar reminders every two months to touch base. If you haven’t reached out in two months, find some excuse—any excuse—to connect. Even if it’s because you’re both fans of the same football team and they won a big game, be sure to send a message so you stay on their minds,” Ahmad says. 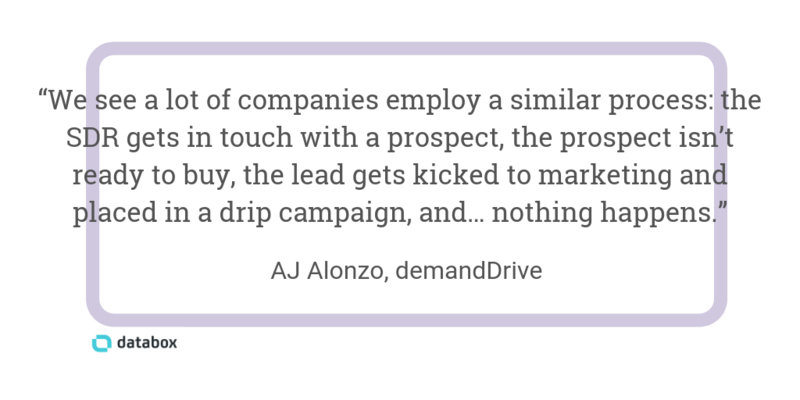 “For us, the best lead nurturing tactic is to let the SDR team handle it,” says demandDrive’s AJ Alonzo. “Handing the nurturing process over to the SDR team allows them to keep messaging relevant, personal, and up-to-date based on changes in the prospect’s online profile. This process is much more effective (for us at least) to take prospects out of the nurturing stage and into our opportunity stage,” Alonzo says. “If you don’t have a dedicated marketing and business development manager, be sure to have those two separate functions working together on content; that’s the number-one way to use content to warm up leads,” Roddy says. 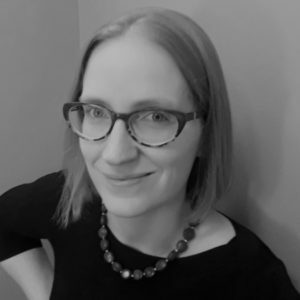 “We’ve found that surveys combined with website user behavior data (such as session recordings) are effective for pre-qualifying leads and customizing messaging,” says Survicate’s Anna Rubkiewicz. “This way, you will show your leads that the queries they’ve been searching for in Google actually relate to a problem your product is an answer to,” Rubkiewicz says. “This means you should expect different sets of questions every time,” Garvin says.